This email got me thinking: Does on-demand color labels fit lean manufacturing principals? As a review, Wikipedia describes lean manufacturing as a production practice that considers the expenditure of resources for any goal other than the creation of value for the end customer to be wasteful; and thus a target for elimination. http://en.wikipedia.org/wiki/Lean_manufacturing. The Lean Institute has a more concise, yet similar description: maximizing customer value while minimizing waste. http://www.lean.org/whatslean/. Although lean manufacturing is a large, complex subject with many highly-paid consultants, I wondered; how many different processes along a value stream for a manufacturer could be made more efficient using on-demand color labels. Processes that require less human effort, less space, less capital, less time and at far less costs and with much fewer defects. So here is my list of 12 processes that have been or could be improved using on-demand color labels. Please remember; this list is not exhaustive; just examples. Further, this list is not in priority; but along a potential value chain of a manufacturer. Label Procurement: By moving to on-demand labels, Procurement can reduce or eliminate the number of different preprinted labels purchased; thus reducing plate setup, freight, and order process charges. 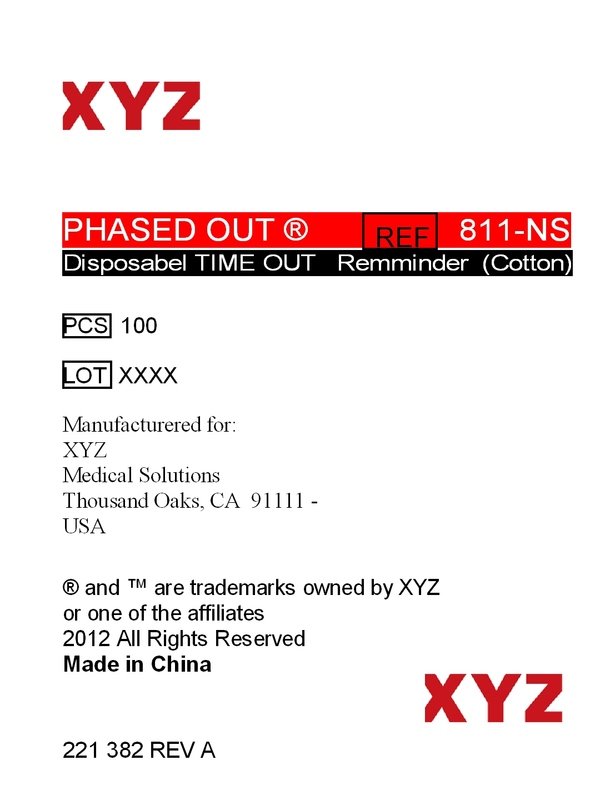 Further, by using continuous labels, manufacturers can consolidate labels to one consistent width and then print to any length, thus reducing orders also. Label Receiving: With on-demand labels, associates responsible for receiving will have fewer different products to receive and process. 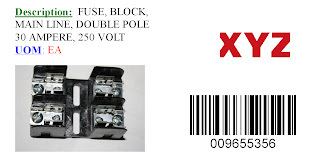 Warehouse Bin Labels: By adding images to the warehouse bin labels, managers will reduce the risk of incorrect picking/put-away of items (see above). Job Routing: By adding color to tickets, job shops will reduce the risk of work orders being routed to incorrect stations or even lost. This reduction of risk speeds jobs through the factory floor, reducing costs. Inventory Reduction: Moving to on demand, manufacturers reduce the value of color label inventory. This reduced inventory not only saves money but also eliminates the large minimum order quantities for preprinted labels. Can you think of any other potential processes to add to this list? I appreciate your ideas and feedback. Based on these 12 processes, it seems manufacturers who consider themselves or who want to become more of a lean organization should move to on-demand color labels. Be sure to ask your manufacturing customers about their interest in adding on-demand color labels to their lean processes. At the recent Epson sales meeting, I learned about 3 new developments for On-Demand Color that I wanted to share with you; early. These developments will help you sell new solutions and improve the out-of-box experience for new users of the TM-C3400. 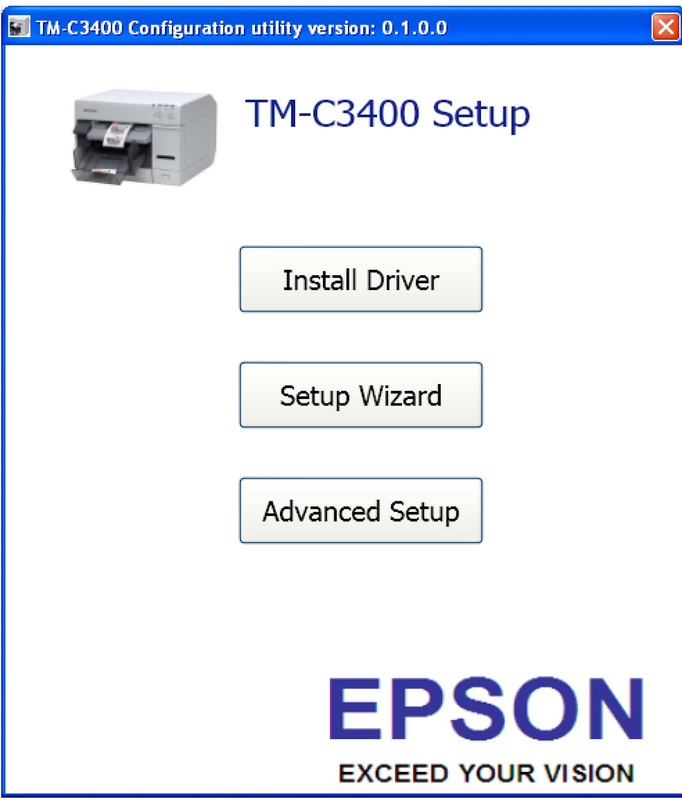 First for the TM-C3400, Epson demonstrated the Easy Configurator. This wizard steps new users through the process of setting up the driver for the first time. According to Touha Mushir, from the Epson Regional Technical Support Center (RTSC) located outside of Toronto, Ontario, “we built the TM-C3400 Easy Configurator to make it much easier and quicker to set up and configure the TM-C3400. As the driver for the printer has many options, we decided to help new users through the process of selecting the correct settings for the labels, tags or wristbands they want to print.” For you and your new users, I will have a version to send out shortly. After seeing the demonstration, this new application will make my and your life much easier! Second, Epson showed a new product currently for sale in Japan; the TM-C3400 LT. 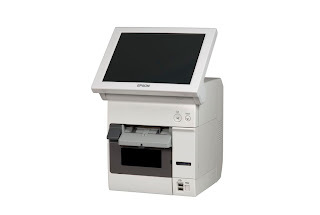 This Label and Tag terminal combines everything you need to run a stand-alone print station, including Embedded processor, XGA touch panel, Embedded Windows 2009, Ethernet, and USB ports to enable you to connect to a variety of peripherals. 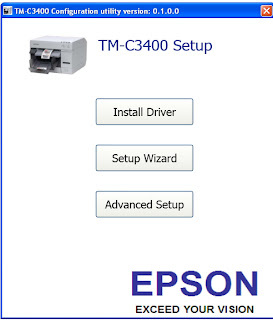 According to Neil Edmonds, Group Product Manager for Epson, “the TM-C3400 LT is available for sale currently in Japan; and we are testing/assessing the market for this product in North America currently”. From my perspective, I see lots of potential applications for this all-in-one product: Issuing Visitor Badges, Printing tickets (attended), Calculating prices/printing labels in delis, and many others. But I would very much appreciate your ideas of where this product may fit. Give me a call or add your ideas on the bottom of this blog. 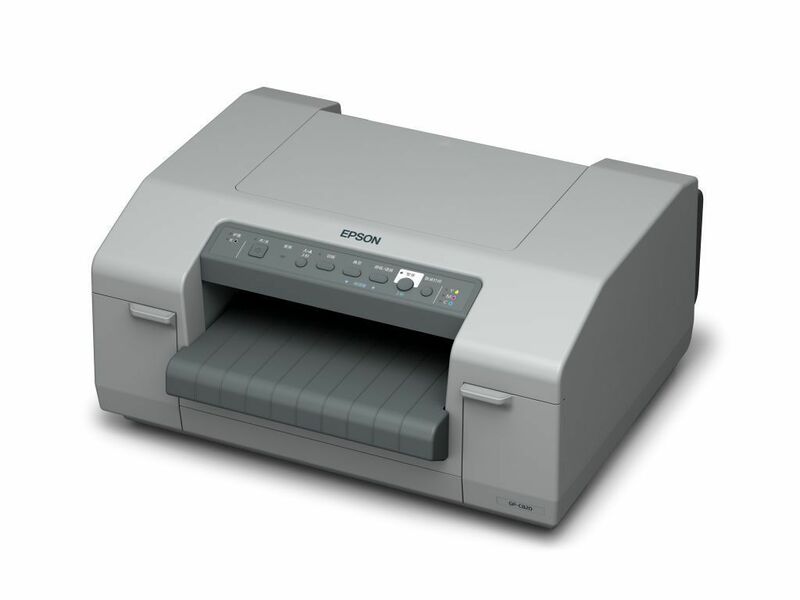 Third, Epson announced plans to launch in North America the GP-C830, the new pin-fed, 8.5” wide printer. 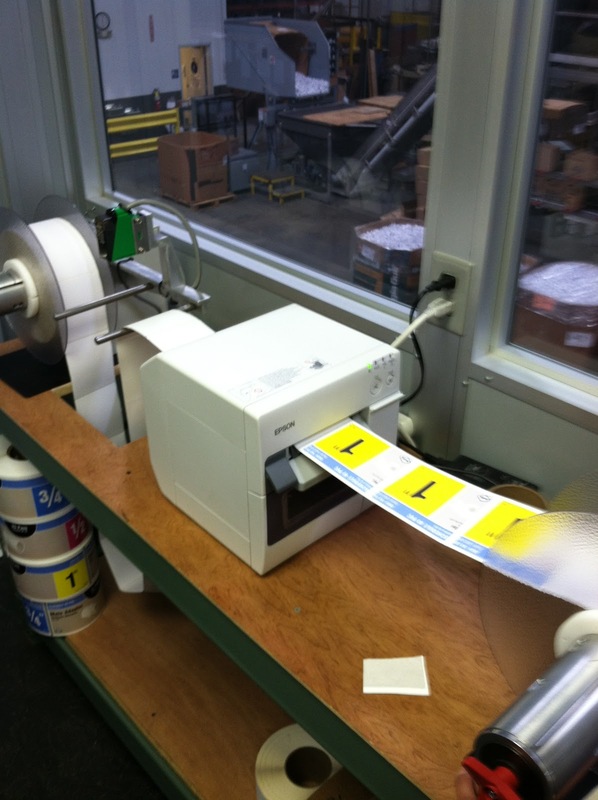 This very durable, 4 color printer is perfect for a variety of color label applications, including GHS drum labels. “With a tractor-feed mechanism and durable pigment inks, the GP-C830 will enable chemical manufacturers to print GHS drum labels quickly and easily; and at a price much less expensive than 4 color laser printers. We plan to launch this new product this fall also.” In addition to GHS labels, I see many other potential applications; especially around manufacturing plants and warehouses. Having seen these new on-demand color label printing offerings, I can envision many new solutions for you to use and sell. Contact me to learn more; or give me ideas of where you see fits for the new products. Ed Shuttleworth of Page Tech Systems Thousand Oaks, CA recently found a great new opportunity for his business; by meeting a new set of customer requirements for a newly merged company. Ed had as a customer, a manufacturer and packager of medical safety supplies, who wanted to begin producing color labels. It seems this manufacturer had, in the past, applied a single color label to all their products. After a merger, the Marketing Dept. in the new combined company wanted a completely different look for their labels. As they produce and package hundreds of different products, they needed a system to produce the labels with the new brand as they were required and in various quantities. The new label design is especially important for the U.S. market and will evolve into a more extensive European market. To find a solution for the requirements of his medical supplies customer, Ed contacted Mike Hoff at ScanSource to get a recommendation. According to Ed, Mike recommended contacting the Epson specialist, Mark Bunnell at ScanSource. The discussion with Mark led to a referral to a contact with me; and a discussion on the TM-C3400. Based on Mark’s recommendation, Ed presented the printer and its considerable capabilities to the customer. The TM-C3400 went over very well with the customer and he was on the way to the first order of 2 units to get the developmental process started. After getting the printers, Ed found it difficult to find media to use with the Epson label printer. About the same time, I contacted Ed to learn about the application at his medical supplies customer. I wanted to provide support and make sure his customer started quickly and easily using the printer. Based on the situation, I worked with Ed to get the correct media as well as provide training for the end customer on configuring and using the TM-C3400. Currently, the manufacturer has one printer in production (see above) and one printer for development purposes. However, in the near future they will begin producing additional color labels on-demand. 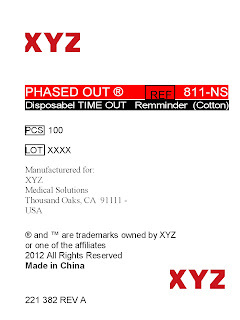 “We plan to have 4 to 5 of our vendors begin producing the new color labels during the packaging process at their own facilities.” By having our vendors produce labels as required, we will strengthen our brand as well as enable the flexibility to revise the labels when necessary” according to the IT manager in the manufacturing company. When you have customers purchasing or merging together companies, be sure to ask them about their branding strategy; and show them how on-demand color labels fit into their efforts to strengthen their new brands. For companies with a large number of SKU’s, on-demand color labeling enables them to reduce or eliminate their inventory of preprinted labels. 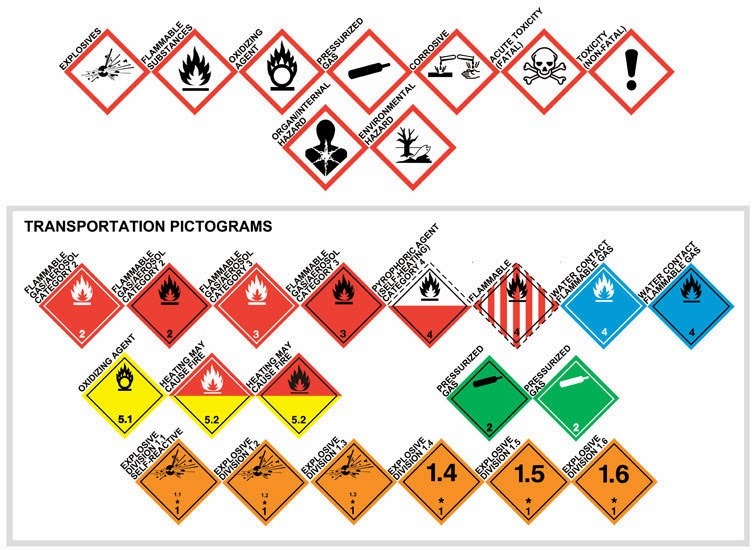 In these situations, manufacturers need the capability to produce relatively small runs of many different labels; each label with variable data. With a 4” outer diameter limit on internal media rolls, I have had many on-demand color label customers asking about using the rear label feed capability of the TM-C3400. As the picture shows, rear feed printing allows large volume label-printing customers to use fanfold media. For example, take a look at this success story covering FX Luminaire who uses fanfold media exclusively. By the way, I setup the unwinder myself; so it must be easy to do. But I needed to change the tension on the unwinder to prevent so much media coming off the roll. 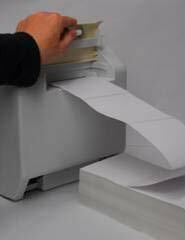 There is a continuously variable “TORQUE” control on the unwinder so you can easily set the feed rate to suit the printer. With manufacturers with a large inventory of preprinted labels, talk to them about moving to on-demand color; even when they require a large volume. It's a good opportunity for both you and them.